​Salient, a Benetau 40.7, is our flagship and will be our primary sailboat for advanced and offshore training. This is the perfect platform for the serious sailor. Salient was prepared to the highest standard by First Yacht Services and competed successfully in the 2016 Vic Maui race. Now in the Simply Sailing fleet, she will sail around Vancouver Island, through Desolation Sound and before too long to Maui. Salient has a modern tri cabin layout. Systems include, radar, AIS (transceiver), chart plotter with latest navigation software, life raft and modern satellite communication systems. Her main sail & jib are designed and built to the latest standards by North Sails. The carbon fiber rudder will keep the boat on her toes even in the toughest conditions. Celeste, a Dufour 31, is a great boat to get you started cruising. The Dufour 31 is a stable, easy to sail an forgiving boat making it the ideal platform for basic sailing courses. Celeste is solidly built and comes with beautiful and comfortable interior. She will take you anywhere in safety. Despite her basic layout, she comes with radar, a small chart plotter and AIS for additional safety. Kanikilak & Orpheus are our training boats for the day sailing course. The San Juan 24 is well respected sailboats in the Pacific Northwest. They were built locally near Seattle. The fact that that these boats are still raced competitively speaks for itself. The SJ24 is the perfect boat for basic sailing lessons. A very forgiving and safe boat, yet a lot of fun in a fresh breeze. It will not let you down, even if the wind picks up. Alegria is a 36' Catalina and will be used primarely for basic and intermediate live aboard training courses. The boat is well equiped for basic training and a pleasure to sail. 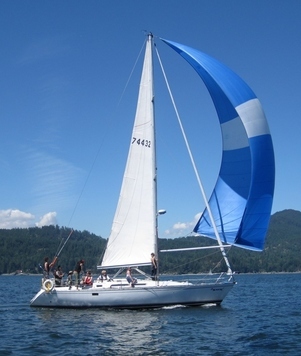 The Catalina 36 is a very popular cruising boat that you will see up and down the west coast. It's Magic, a Beneteau 38, has been with us for many years now. With a three cabin layout and a spacious cabin & cockpit, It's Magic is the perfect platform for our sailing expeditions. Many of our students had the pleasure of sailing this boat over the last years and would attest she is a pleasure to sail. ​The boat will be used primarely for intermediate training, occasionally for basic courses and certainly for larger groups when more than one boat is needed.